After the French lost at the Battle of the Nile the Ottomans changed their stance when it came to the French. They started to believe that they could beat the French since they had no reinforcements or supplies without naval support. Sultan Selim III sent 2 armies to Egypt to fight the French, but picked up tons of troops as they got closer. When the French realized this was happening they would choose to meet the army in Syria, knowing that the longer they marched, the more people they would gather. Napoleon would send 1,000’s of troops and 80 cannons with them as they marched towards Israel and Syria. Napoleon realized that they had to take the city of Jaffa or else they could be surrounded in later battles. This was a tough city to take because it had high walls and towers with solid troops guarding it. Napoleon knew that this was going to be a brutal war so he sent messengers with an ultimatum to the city, hoping to end the war before it began. The leaders of the city would take the messengers and torture, castrated, and decapitated them (displaying their heads on the walls). tower to fall and allow the French to enter the city easily. After taking the city, he would find 1,400 POW’s that he had previously released in previous cities, making him realize he can’t release anyone again. 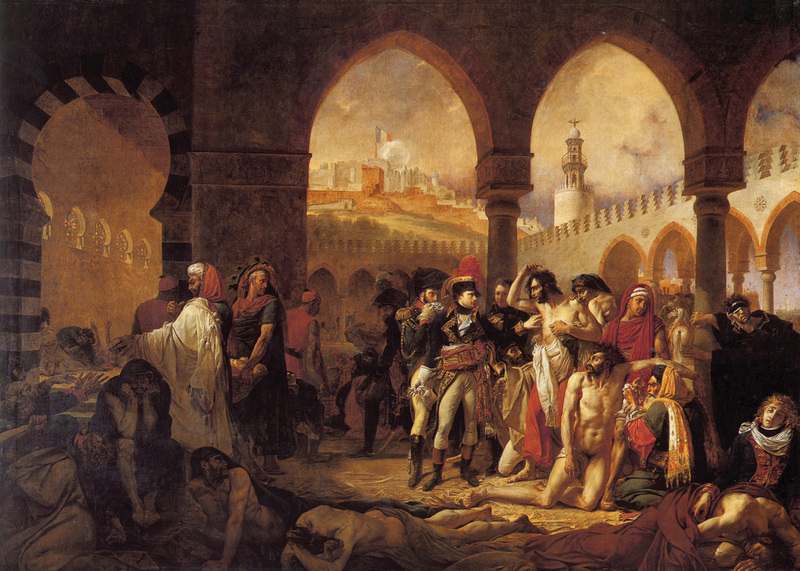 Between this and the fact that his messengers had been slaughtered, Napoleon allowed his soldiers to spend 3 days massacring the city in the most inhumane ways possible. His soldiers would kill 4,000 people, including women and children, and often did so through drowning so that they could save the bullets. Some people consider Napoleon horrible for these actions, but others claim that he had no ability to keep this many prisoners with him while he marched to other cities. Before departing from the city of Jaffa, the French would allow 100 people to leave so that they could spread the word of the repercussions of defying him. This would backfire to an impressive degree because the other cities refused to surrender for anything after hearing the news. The decision was also made to leave the large contingent of sick behind in Jaffa, creating a hospital for the soldiers before leaving them. The French would continue to have issues with sickness as they proceeded deeper into the territory though.